Versatile brushing thinner improves flow characteristics and slows drying to extend wet edge working time for specified TotalBoat coatings. Also great for removing paint from tools and equipment, making cleanup easier and faster. 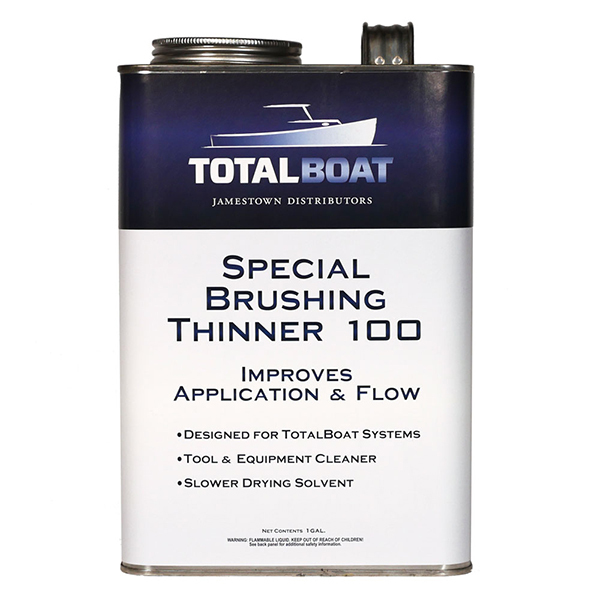 For brush or roller application, TotalBoat Special Brushing Thinner 100 can be used to thin specified solvent-based TotalBoat primers, bottom paints, and topside paints to make them flow more smoothly. Improved flow characteristics make application easier, enhance the finish quality, and extend the service life of the coating. Special Brushing Thinner 100 can also be used in warmer temperature conditions to give you more wet edge working time and improve flow for TotalBoat Topside Primer, TotalBoat TotalBilge, and TotalBoat Lust Spar Varnish. When you’re done painting, use Thinner 100 to get the paint off your tools and equipment quickly and thoroughly. For use with specified TotalBoat products. Mix with primers or paints, as needed, and as recommended. 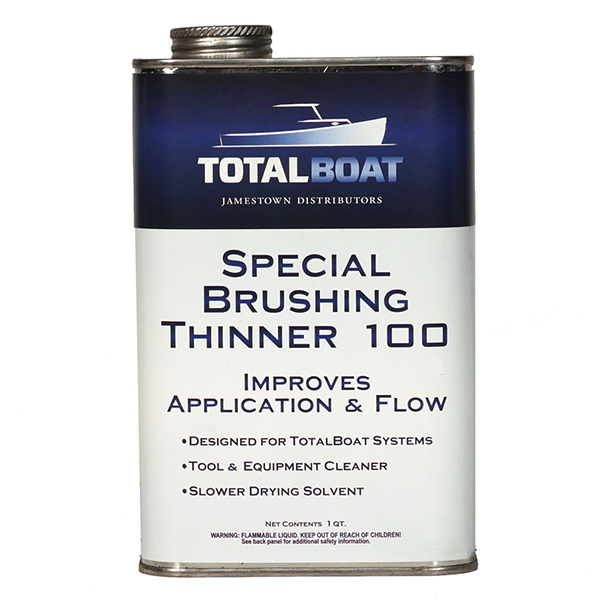 TotalBoat Special Brushing Thinner 100 is not designed for use with all TotalBoat products. See usage recommendations below. Please contact our Tech Team members at (800) 497-0010 if you have any questions regarding compatibility or usage. VOC content: < 6.78 lbs./gal. Warning! Rags, steel wool, or waste soaked with Special Brushing Thinner 100 may catch fire spontaneously if discarded improperly. Immediately after use, place rags, steel wool, or waste in a sealed, water-filled metal container.